“I’m not here to be a tourist,” I protested to Florina Benoit, MA ’04. “I just have 18 hours here. Wouldn’t it be better to relax here for a while?” I could get away with whining to Florina – we had known each other for 12 years, ever since we were both graduate students at EMU’s Center for Justice and Peacebuilding. Now she was my guide on a whirlwind trip to India for Peacebuilder magazine. Earlier, I had tried to keep up with Florina as she wove through the crowd around our jam-packed train. I hadn’t slept soundly on my thin plastic-covered mattress on a top bunk – with other sleepers breathing heavily nearby – as we traveled eight hours north from Chennai to Hyderabad to visit her former workplace, the Henry Martyn Institute (HMI). At daybreak, I had climbed down from my bunk, trying not to disturb anyone, and stood by an open doorway near the toilet at the end of our train car, absorbing the beauty of the south Indian countryside for an hour or so. I felt no inner struggle – at that time, I knew nothing about the displacement of rural-dwellers for resource extraction and the destruction of scenes like the ones we were passing. From the windows of the automobile that picked us up at the Hyderabad train station, I enjoyed low-stress sightseeing. The ride took us alongside the city’s 1,200-acre lake, with a 60-foot-tall statue of the Gautama Buddha towering on a small island, and past awakening streetside businesses. But now, in the late afternoon, my energy was flagging. I was baffled as to why Florina wanted me to leave the institute’s pastoral premises, where I felt a strong urge to nap in my comfortable bed in a private room provided by our hosts. But she was persuasive and I relented. That’s how I found myself on a stone platform after climbing 149 narrow, winding steps of the Charminar mosque-monument. I had ascended through one of four mammoth minarets, connected to each other by four grand archways. Charminar is smack in the middle of what’s called “The Old City” of Hyderabad, where the majority of the residents are Muslim. As Florina and I gazed over a packed street scene below Charminar, a smiling guy who looked to be in his 20s invited himself to be our tour guide. He explained that the massive mosque visible on the right side of the crowded street was Mecca Masjid, dating to the same ruler as the one who built Charminar. The Masjid got its name from foundational bricks composed of soil brought from Mecca. The structure can hold 10,000 worshipers at a time. At left along the street below was the Government Ayurvedic Hospital, housed in a colonial-era complex that was crumbling but still lovely. Judging by its name, the services within this complex were based on a Hindu-yogic medical tradition dating back to the Vedic age of India (ca. 1750–500 BCE). When Florina and I exited Charminar, we passed an ornately decorated, tent-looking structure pressed against one side of Charminar’s massive foundation. This turned out to be Bhagyalakshmi, a Hindu shrine dedicated to the Goddess Lakshmi. This shrine apparently began with the placement of a small statue in Lakshmi’s honor in the 1960s. The visit to Charminar worked on me, as Florina knew it would: I began to grasp how closely Hindus and Muslims bump against each other in Hyderabad – a city where Muslims were in the majority before 1948 and now are a minority, except in the Old City – and how tenuously peace has been maintained (or not) over the last half century. In September 1983, during a religious festival, certain Hindu organizations put up big cloth banners in the Old City calling for India to be declared a Hindu Riots developed in which 45 people were killed. In December 1990, rioting raged almost two weeks – believed to have been initiated by non-locals for the national political gain of a particular party – which destroyed countless homes and businesses and cost the lives of hundreds of Hindus and The assaults were vicious: amputations, disembowelments and rapes. Under cover of night on November 1, 2012, Hindu temple officials began to do some construction at the base of Charminar, saying they were simply adding decorations to their Police stopped the non-permitted construction. Muslim-Hindu tensions rose. Two weeks later, violence broke out after Friday prayers at the Mecca Masjid, when Muslims began streaming towards the Hindu shrine at Police intercepted them. Street-fighting ensued. Florina murmured to me that the Hindu shrine looked bigger each time she visited Charminar. She, a Christian, viewed it as a provocation to Muslims who treasure the Persian-Islamic cultural and religious heritage embodied by Charminar. Our Charminar tour set the stage for a visit that evening to an Old City center for community gatherings and vocational trainings, sponsored by the Henry Martyn Institute, directed by staffer Abdul Majid Shaik. Majid, a conservatively dressed Muslim who is a former social work student of Florina’s, showed us classes of males working on computer hardware and networking, refrigeration/AC mechanics, and typewriting. 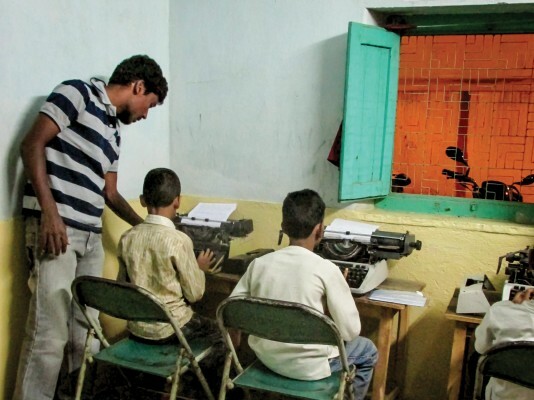 He said such vocational evening classes attract young Hindu and Muslim men from the neighborhood – 150-200 of them annually, from early teens in the typing classes up to early thirties in the other classes. During the day, he said, girls and women from the neighborhood came to religiously mixed classes, often sewing or embroidering together. They generate a bit of income sewing clothes for neighbors and friends. This, Majid explained, makes the men in their families more willing to let them come to the center. They also can take classes in literacy, typing and hair styling. Separately, the men and women learn about HIV-AIDS – a major health issue in Hyderabad – and have access to an HMI-supported health clinic staffed by a physician and a nurse. In addition to learning useful skills, all students were guided to talk to each other about their lives and religious practices, and to respectfully share parts of each other’s celebrations and festivities. Mixed-religion picnics and other outings are occasionally organized. Between 1971 and 2002, the Henry Martyn Institute occupied office space on a busy thoroughfare in Hyderabad. For most of those years, it was called the Henry Martyn Institute of Islamic Studies, focused on interfaith dialogue. The 1990 riots catalyzed the institute into reconsidering its role in Hyderabad. In 1999, the name was changed to the Henry Martyn Institute: Centre for Research, Interfaith Relations and Reconciliation, reflecting its fresh focus. In 2002, following successful fundraising, Henry Martyn moved to five acres on the outer edge of Hyderabad, where it has established a retreat-center atmosphere, with a cluster of modern buildings amid well-tended grass, flowers, trees and a pond. It feels like an oasis of peace alongside the crowded bustle of its home city. … to provide space for Hindus, Christians and Muslims to build relationships; to make available conflict transformation workshops in violence-prone areas such as Nagaland, Manipur, Kashmir and Gujarat; to make possible women’s interfaith journeys, causing women from different countries, races, creeds and castes to travel together to understand what interfaith relations and conflict transformation mean from woman’s perspective. Andreas also wrote about deciding, after the 1990 riots, that “intellectual dialogue alone is of little consequence if it does not help in transforming the lives of the dialogue partners.” He wanted the institute to add a “praxis” (i.e., practice) component to its academic study. As a result, Andreas and former associate director Diane D’Souza focused on development work in the riot-affected slums of the Old City of Hyderabad in the 1990s – initiating and encouraging vocational training for men and women in mixed-religion classes, healthcare outreach, and mixed-religion schooling for children. Stephen Gonsalves, MA ’03, an HMI board member who then represented Mennonite Central Committee (MCC), encouraged the institute to complement its praxis of development with the praxis of conflict transformation. The idea seriously took root in 1999 with the arrival of Ron Kraybill, one of the founding faculty members of EMU’s Center for Justice and Peacebuilding. With special funding from an MCC donor in Canada, Kraybill was able to settle his family in Hyderabad and to use a year-long sabbatical to set up a conflict transformation team within the Henry Martyn Institute. Staffers Diane D’Souza and Ramesh Prakashvelu quickly absorbed Kraybill’s teachings, integrated them with their own experiences, and began putting them into action. They especially liked the concept of experiential and reciprocal learning, wherein workshop participants tap their own life experiences, play active roles in the workshop, and are teachers as well as learners. In short, everyone learns from each other, including the facilitators from the participants. 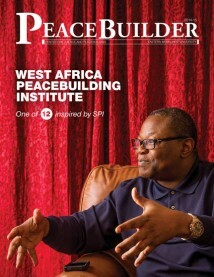 From 2004 to 2011, HMI offered a post-graduate diploma in peacebuilding that could be earned in nine months. (HMI’s academic department continues to offer a nine-month diploma program with focus on Islam and interfaith relations.) Today, intensive on-campus training for 30 participants occurs via the South Asia Peace Workshop, which runs in the early fall for a week or more (depending on the year and the coursework offered) in a manner similar to SPI. From its earliest years, HMI’s conflict transformation team wasn’t content staying close to home. Staffers gave trainings in distant conflict-ridden regions of India, especially its Northwest. India’s troubled Northeast floats apart from the India featured in tourist brochures – it’s like a huge balloon connected by a slender land thread to the Indian subcontinent. The region consists of Sikkim, plus seven contiguous states: Arunachal Pradesh, Assam, Manipur, Meghalaya, Mizoram, Nagaland and Tripura. In three of these states, the majority of people identify themselves as Christians, a legacy of missionaries in the late 1800s. Indigenous (“animist”) religious practices prevail in most places, even among many who call themselves Christians, Hindus or Muslims. These states comprise 209 tribes, speaking 175 languages mostly belonging to the Tibeto-Burmese category. The start of HMI’s work in the Northeast can be traced to a three-week workshop on conflict transformation in Darjeeling in May 2000, facilitated by Kraybill, Diane D’Souza and Ramesh. The Naga Women’s Union Manipur then invited them to work in the Northeast. HMI staff thus began working in Manipur (from 2000), Nagaland (2001), Assam (2002), and Arunachal Pradesh (2002). “We began by building relations with key social, human rights and church-based peace organizations,” says Ramesh. Two CJP graduates – Aküm Longchari, MA ’00, a newspaper editor in Nagaland, and Babloo Loitongbam, MA ’06, a human rights worker in Manipur – were invited to workshops “as resource persons to share their insights, knowledge and wisdom related to peace, reconciliation and human rights work,” Ramesh explains. In 2008, I joined with other representatives of civil society organizations to form the Naga Forum for Reconciliation, with support from members of the Society of Friends in Britain and members of the American Baptist Church. The forum seeks to reconcile various Naga armed groups on the basis of the historical and political rights of the Nagas. The forum has been meeting with militant groups … and the groups are moving away from violence and mistrust toward fragile progress and decreased violence. The cycle of violence keeps the region in turmoil. There are a number of insurgency groups vying for autonomy or outright independence. This in turn makes the [Indian] military use harsh measures. Great economic difficulties drive desperate people to join the insurgencies and the cycle continues. Two years after completing her MA at CJP, Florina Benoit joined HMI as associate director of praxis, responsible for four teams: conflict transformation, community development, women’s interfaith journey, and tsunami relief and rehabilitation. Florina shepherded to publication A Manual for Facilitating Peace Building Processes and brought in playback and interactive theater and puppetry, which complemented the arts-based work HMI had been doing through the visual arts, especially paintings. In her 30 months at HMI, Florina’s conflict transformation staffers led about 30 trainings per year – reaching about 600 people annually – largely in the Northeast, but also in Kashmir (with the India-Pakistan conflict and its effects) and Gujarat (west coast location of recurring riots and massacres between Hindus and Muslims). While employed at HMI, Florina did doctoral work at Osmania University. After completing her PhD in 2008, she resigned from HMI to return to her husband (social work professor Ashok Gladston Xavier, MA ’04) and their home in Chennai. As did Florina before him, Ramesh heads the praxis programs of the Henry Martyn Institute. My first impression of Ramesh wasn’t of him – it was of his black T-shirt, featuring a dignified-looking American Indian man wearing an eagle-feathered headdress. From beneath a tan-woolen visor, Ramesh’s hair flowed loosely below his shoulders. He was not one who would blend into a crowd. Ramesh holds a master’s degree in international peace studies from the Kroc Institute at the University of Notre Dame. He’s been doing peace work for 16 years, often in sensitive situations that can (and do) regularly explode into conflict. Four full-time staffers and two associate facilitators report to him. Collectively, they train about 450 people per year. I soon realized Ramesh’s appearance heralded his passion for indigenous peoples – for their connections to nature, for their spirituality, for their relatively egalitarian ways of living, for their need for justice. For survival. A month earlier, Ramesh had directed the ninth session of the South Asia Peace Workshop, which centered this time upon three topics: the UN Declaration on Rights of the Indigenous People; the relationship between respect for individual/group rights and peace; and appropriate development alternatives for indigenous people. Called “tribals” in the Northeast and adivasis in other regions, the indigenous peoples of India have been described as the most exploited people in that country. 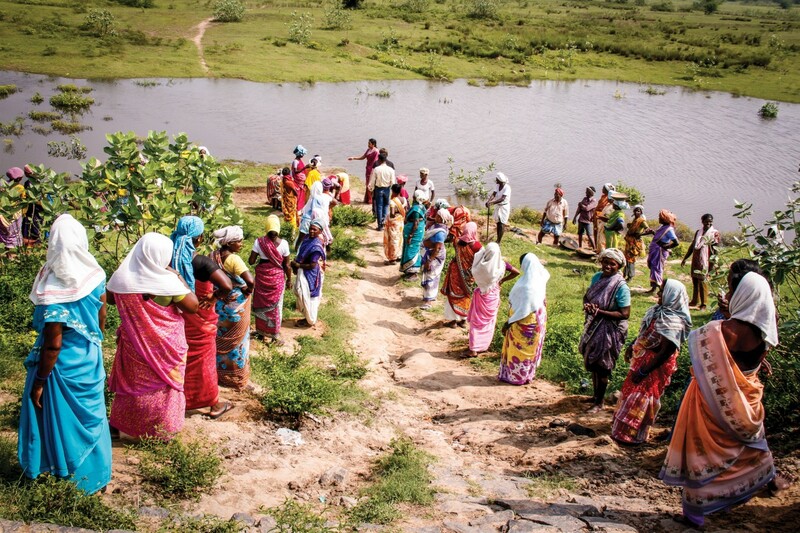 “Nobody likes to have their land stolen,” said Ramesh, by way of explaining why tribals throughout India are distressed and choosing to resist in some manner. Ramesh and his team are trying to offer tools for transformation that are alternatives to taking up arms. Throughout much of the Indian subcontinent, the possibility of warfare lurks just beneath the surface. Immediately north of Hyderabad, for example, is the “Red Corridor.” This is a swath of central India where Maoist guerrilla fighters known as Naxalites are most active. Of India’s 84 million tribals, 70% of them live in this Red Corridor, where they are facing massive displacement and communal destruction in India’s rush to extract coal, iron ore, limestone, dolomite, and bauxite, according to National Geographic (April 2015). Dams for hydroelectric power are also being constructed. Amid this widespread extraction, the Naxalites combine intimidation, youthful soldiering, and populist appeals to flesh out their ranks of fighters. “Rather than reduce the imbalance between the rich and poor, mineral wealth has exacerbated the divide, adding pollution, violence and displacement to the daily struggle of those whose livelihood is locked up in the land,” said National Geographic. The five who make up the core conflict transformation team at HMI reflect the diversity with which they must grapple in their work. Ramesh is a Tamil with indigenous sympathies, Robinson Thapa is a Christian tribal member from the Northeast of India, Jalaja Devi is a Hindu woman from Kerala, and Najma Sanai and Arshia Ayub (both associate facilitators) are Muslim women from Andhra Pradesh. Veteran facilitator Robinson belongs to the Tangkhul tribe, one of 16 tribes in Manipur. He saw his father killed. Close friends and relatives were raped and tortured, if not killed. “I grew up in a place where violence seemed to be the only way to address the issues that we faced.” He himself once believed in armed struggle. Today, Najma works in both the praxis and academic wings of HMI. On the academic side, she regularly lectures on Islam and women’s rights, trying to dispel what she regards as myths pertaining to the religious basis of the subjugation of women. Beginning in 2002, for example, HMI staffers worked patiently and persistently for two years to bring 42 leaders from different communities and tribes in the Northeast together for the first time to talk about their common problems and possible solutions. The logjam was broken by women in the communities, Ramesh said, who were the first to see the possibilities of such a meeting. Now he sees increasing numbers of young people – some from human rights organizations, some from women’s groups – who want to collaborate on peacebuilding. HMI’s conflict transformation work over the years has been largely supported by grants from church-based development and relief organizations, including Bread for the World-Germany, Mennonite Central Committee, the Evangelical Lutheran Church in America, the Church of Sweden, the Church of Scotland, and KAIROS – Canadian Ecumenical Justice Initiatives. A handful of governmental agencies, such as the United States Institute for Peace and the Canadian High Commission, have also contributed. When Ramesh and his team aren’t doing trainings or interventions (or preparing materials to do these – everything is customized to suit the context), they’re preparing reports for their funders or writing applications for further funding. They feel challenged to communicate the necessity of culture-sensitive, region-specific, participatory approaches to trainings that aim at empowering as many people as possible to do peacebuilding in their own ways, adapted to their own environments. This is not something that can be accomplished quickly. Of the five proposals written for 2014-15, two yielded funding for HMI’s conflict transformation work. In its earliest decades – in the 1930s, 40s and 50s – the institute existed to acculturate Christian missionaries from Europe and North America who were intent on spreading the gospel among Based in six cities at different times, it served an evangelical purpose of some kind through the 1970s. Today HMI is directed by Rev. Dr. Packiam T. Samuel, who makes it clear in an interview with Peacebuilder that HMI harbors no proselytizing tendencies, instead promoting understanding of, and respect for, the positive attributes of India’s religions and ethnicities. The information in the Henry Martyn peacebuilding manual will feel familiar to those who know another manual originally connected to Kraybill’s teachings, the Conflict Transformation and Restorative Justice Manual, published in five editions since 1989 by MCC (the latest issued in 2008). The two articles dealing with playback and interactive theater in the 2008 MCC Conflict Transformation and Restorative Justice Manual were written by Florina Benoit and Ashok Gladston Xavier (her husband). When this Peacebuilder was at pre-press stage in April, Florina Benoit conveyed the distressing news that Robinson Thapa had died after falling ill while conducting a workshop in Imphal, the capital of his home state.